“Salis Escapes”, dreamlike atmospheres and extraordinary adventures in the first ebook of the Salisedine series. At Amazon and itunes stores. Eyes as blue as the ocean and only one wish: to escape, run away from the Mineral Kingdom’s Salt Crystals ,which dominate a post apocalyptic world. 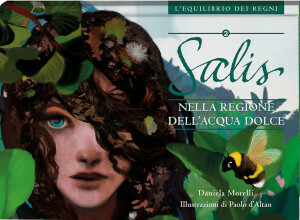 This is Salisedine, or Salis for short, a fourteen year old girl, protagonist of the extraordinary adventure “Salis Escapes”, the first episode of the Salisedine series, a digital project which is also available in traditional form, intended for children 11 years and upwards. “Salis Escapes” is an App for iPad with magical animations and dreamlike atmospheres, but it is also especially the first step of an editorial project for teens which includes an illustrated ebook, a printed book and a contemporary opera libretto which will debut on June 28 at Milan’s Piccolo Teatro Studio Melato. 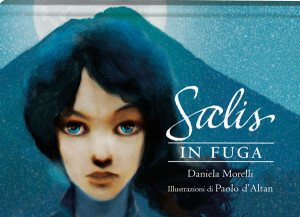 Poetic images of the characters and landscapes in “Salis Escapes” – drawn by Paolo d’Altan, based on subject and texts by Daniela Morelli – can be touched, opened, explored from the iPad screen. The plot is simple, but charming: it all starts with Salis escaping from the camp where she lives, where the Mineral Kingdom dominates people and forces them to work as slaves of the Salt Crystals. There is barely enough time to escape: the Moon stills in the sky, just long enough to let a single person cross the border and save themself. Salis will try to do it in any way she can. The iPad App “Salis Escapes”, produced by Rebelot is intended for children 11 years and upwards and for all those adults who would like to discover a world where important changes are possible. It can be bought at the itunes store for € 1,79. It is also available as a Kindle ebook on Amazon for €1,99.